AlphaNinja - This morning Cavalier Homes (CAV) announced it has agreed to be purchased for $2.75 per share, a 23% premium to Friday's closing price and up near the the 52 week high. What's interesting to me in this "activist" situation is that the shareholders arguing for change are also in the housing business. The "Cavalier Homes Committee for Change" owns just under 10% of the company shares and was waging an ugly 13d campaign against management, whom they argued were performing even worse than the dismal manufactured homes market. The CHCfC is led by a group of manufactured housing veterans, who on the surface seem to be mainly concerned with Cavalier's decisions as they relate to excess overcapacity in the industry. FACT: Cavalier recently reported in its latest quarterly report that its first quarter market share in Cavalier’s “core” 11 states decreased from 10.0% to 8.8%, despite the fact that the number of companies operating in this market has significantly decreased. Patriot and Fleetwood have each gone bankrupt, Palm Harbor closed its North Carolina plant and General Homes closed its Georgia facility. With the decrease in the number of companies serving this core market, we question which manufacturers have picked up this market share: Horton Homes? Clayton Homes? River Birch Homes? We believe Cavalier clearly has not. FACT: Industry-wide shipments of manufactured homes to Cavalier’s core states (excluding the partial states of Florida, Missouri, and Oklahoma) were down only 16% from 2006 to 2008, but Cavalier's shipments to these core states were down 26% during the same period! In 2009, while industry statistics show January's shipments down by 33% in these core states, Cavalier's first quarter revenues were down a whopping 60%! As the numbers show, in Cavalier’s core states, their market share is rapidly eroding. We believe cost cutting, without a real plan for revenue growth, will simply result in more pain for stockholders. Instead of “weather[ing] the storm,” by liquidating asset after asset after asset to maintain the appearance of profitability, we believe the Board needs a serious business plan to either improve revenue or regain market share. FACT: Cavalier states in their letter (inclusive of grammatical error) “Has worked to provided wholesale floor plan financing." We ask the Board to explain what they have accomplished, since their latest quarterly report merely states, “We continue to explore alternatives to the current crisis in wholesale floor plan lending for our independent dealers to enable them to purchase our products.” Is this what they mean by “proactive”? It’s already May 2009 and we believe the Board has yet to produce a wholesale financing plan, other than to say they intend to use cash in the future to provide financing. We have been encouraging the Board to develop a wholesale floor plan program since May 2008! And again in June 2008! And again in November 2008! GE, Textron and 21st Mortgage all announced last year that they would no longer provide floor plan financing to Cavalier's retailers, yet the self-described “proactive” Board has still failed to act. 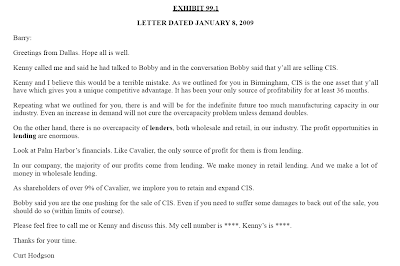 FACT: Cavalier “divested” its retail financing business by selling CIS. The Board states in its letter that they left this business “…because it eliminated the risk in Cavalier’s retail finance business, freed up capital and allowed management to focus on the Company’s core manufacturing operations.” Was the Board unaware of the fact that a government program had already been announced to reduce the risk in the retail finance business (Subtitle B of Title II of the Housing and Economic Recovery Act of 2008; Public Law 110-289, "The FHA Manufactured Housing Loan Modernization Act of 2008," approved July 30, 2008)? FACT: Cavalier’s revenues in the first quarter of 2009 are down 60% from the first quarter last year, while SG&A expenses only decreased 27%! The Company appears to applaud itself for improving its gross margins; however, according to their first quarter earnings conference call held on April 24, 2009, gross margins (excluding certain items) were approximately just 17%, which included a 2.5% decrease in the cost of raw materials. We believe the conference call revelations leave little doubt that the Company is actually suffering significant losses from continuing to operate a single line of business – manufacturing. In fact, Cavalier’s five remaining manufacturing plants are operating at only 27% capacity, a level which we believe will produce sizeable operating losses. In our opinion, over the last ten years, this self-proclaimed “proactive” Board has overseen the dwindling of Cavalier's independent dealer base, massive declines in quarterly revenues by approximately 85%, cumulative losses mounting to over $75 million, and the disintegration of total assets from approximately $244 million to $76 million. AlphaNinja - The shareholder group mentioned above, interestingly, is lead by Legacy Housing, whom Cavalier accuses of being a "direct competitor." Legacy denies this based on its distance (Texas) from Cavalier's market. It appears that in this sale, the shareholder group is getting both a big gain on their holdings in CAV, and probably a smarter management in charge of Cavalier's remaining assets - a plus for their industry.